When driving across a railway level crossing what must you check? When driving across a railway level crossing you must check that there is space for your vehicle on the other side of the line. True or false? When driving across a railway level crossing you must check that there is space for your vehicle on the other side of the line. True or false? You must check there's enough room to get your vehicle across or you may be stranded on the lines when a train is coming. When driving across a railway level crossing you must check that there is space for your vehicle on the other side of the line. This is especially important if you are driving a long vehicle. As you can see in the video below, if you get caught out on the crossing, the train cannot stop quickly. Therefore, as you approach a railway level crossing, check how many lines you will need to cross, and that there is enough room for you to pass over the crossing and leave at least 5 metres behind you (5m is about the length of a large car). Be careful in rush hour because vehicles can be slow moving and stop suddenly. Also be careful where there is an intersection soon after the railway crossing because a large vehicle could stop to turn left (if there are pedestrians crossing) or right (if it has to wait for oncoming traffic) and block the road, causing vehicles to stack up behind it. Crossings where this is a risk often have yellow cross-hatches on them that warn drivers not to block the lanes. If you do inadvertently become stranded on the lines, you might be able to drive around the barrier to get off the track. If you can't get off the track, get out of the vehicle and move well out of the way, towards the direction that a train is coming, in case the train hits the vehicle and it ricochets out of the way. 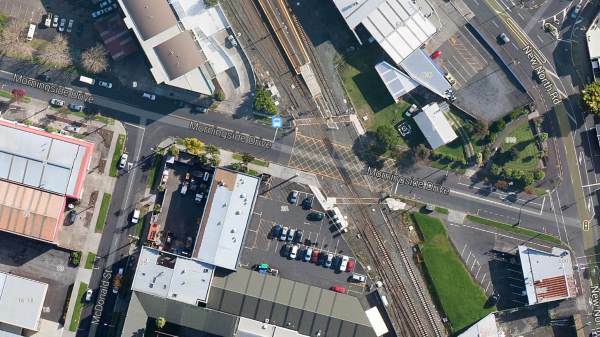 As you can see in this satellite photo of the crossing on Morningside Drive, Auckland, there is a long cross-hatched area (marked in yellow lines) which is the no stopping area across the tracks. To the left in the image there is a left turn immediately after it (McDonald), and a bit further on (out of view) a road to the right. On the right of the image, traffic will queue at the traffic lights onto New North Road. This is one of the most dangerous crossings in Auckland and has seen serious accidents and fatalities. Full 2015 injury data for level crossing crashes involving motor vehicles not available at the time of writing this. Latest data can be found here. Other causes of accidents on railway lines include vehicles getting stranded due to grounding or breaking down, drivers or pedestrians not looking at uncontrolled crossings, or drivers deliberately driving around barriers that are closed.